A fixture in the New England area jazz scene for some time, trumpeter, and flugelhornist Joe Mongelli builds upon his creative arranging skills with his recording WashAshore. A well-crafted ten-piece musical statement of arrangements and well-known standards with a contemporary jazz flavoring. 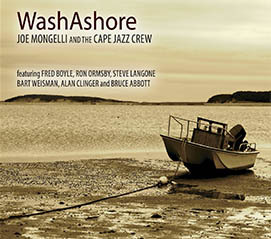 Mongelli is joined by his crew to form, Joe Mongelli and the Cape Jazz Crew. The crew consist of: Fred Boyle: piano, Ron Ormsby: bass, Steve Langone: drums (except tracks 3, 4, 8), Bart Weisman: drums (tracks 4 & 8), Alan Clinger: guitar (track 6) and Bruce Abbott: flute (track 4). The music is a strong jazz statement containing a touch of bop, blues and some burning accessible material delivered with a lot of soul. There are many factors that make this album so appealing, two are the excellent arrangements of the tunes and the comradery the cast of players have that Mongelli has chosen to perform with him on this album. Mongelli’s arrangement of Ellington’s “I Got It Bad” brings a fresh perspective to this melody. With interesting rhythmic turns and band hits, harmonic surprises and relaxed interludes, the warm flugelhorn sound from Mongelli states the melody. Boyle takes the first solo, keeping the melody close to heart, he strikes a perfect balance between technique and melodic statements. Mongelli’s solo is beautifully played with a bossanova undercurrent. He is always clear in his phrasing and melodic direction, but above all, each phrase is delivered with passion and warmth of sound. The light and tender ballad “Alfie” features Mongelli’s flugelhorn along with Boyle on piano. The duet’s playing is beautiful and features Mongelli’s ability to convey a melody in a solid performance. Boyle’s accompaniment is sensitive and accents Mongelli’s playing with splashes of colorful chords and keeps the pace moving. The medium tempo swing “Doxy,” which turns out to be one of the highlights of the disc, is given a first-rate arrangement with a well written shout chorus, adding to the depth of the tune. Mongelli plays a swinging muted trumpet solo and Abbott on flute followed by some handy work on the keys from Boyle—all marking this track a keeper, and worth repeated spins. What I like best about this group is they just lay out the swing, and it works, especially for the listeners enjoyment. Herbie Hancock’s “Watermelon Man” is presented in a medium tempo funky groove. Featuring adventurous solos from Mongelli and Boyle, with the leader displaying very expressive trumpet work. The arrangement is the catalyst that makes this well-known vehicle work, inspiring the performers as they take us along to enjoy a jazz landscape of sounds. Clearly, a treasure and a gem of a track, you can tell they have had fun with this tune live for many years. Overall, Mongelli and is crew are a melded match that sparkles as well as swings. A delightful listen from start to finish. Be the first to comment on "Joe Mongelli | WashAshore"